This website is still in the early stages. You can sign up to the RSS feed to hear about new art articles and new paintings as they are added. Just click on the button below the navigation bar on the left. Stephen Lewis Gilmore is a very English artist, known for his studies of the chalk downs and grassy uplands of Southern England with its undulating hills, magnificent farmland, beautiful woodland glades and forests. Stephen Lewis Gilmore has made this landscape his own through paintings that display a fresh and immediate approach to landscape art where he invites you to join him in celebrating his art and sharing his vision. You can also own this original art to share in a unique relationship with this land of ancient paths and settlements. This is a land blessed with richness. Through Stephen's skilful original paintings you can gain a deep presence and joy. "My whole completeness, my way to God if you like, has been through the earth we stand upon in this beautiful part of England. This sacred ground feeds us but it holds much more than sustenance for the body. I have seen through to the deepest core of my being here to meet with God and find the very colours that `breathe in and out` for me, thereby providing a sort of spiritual life support system that is all I need to feed my soul, I call it....my `heart of chalk`. With this I am complete, whole, truly rich!" I am a British artist greatly inspired by the local Wiltshire landscape. I paint in many different artistic mediums. As I add to the website you will see oil paint art, watercolour and acrylic art painting or pen and ink, engraving, tempera or mural works of art or sculpture. You will see original fine art paintings to buy representative of the very best in British painting. Many of these works of art are held in private collections all over the world. I am available for commissions including landscape paintings and portraits from life or photographs. This website is in its early days. Feel free to sign up to the RSS feed below to be notified when I add to this art website. Whether you are motivated by passion for the subject matter, my artistic style or as an art investment welcome. Original Art Blog in which English Artist Stephen Lewis Gilmore shares his original art paintings including landscape oil paintings, acrylic art landscapes, watercolours. 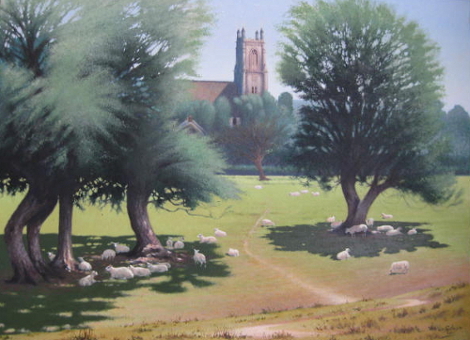 The landscape painting of Stephen Lewis Gilmore, lover of the chalk landscapes of the Wiltshire downs. English Contemporary Art For Sale –Oil and Acrylic. Art commission original work. Beautiful seascape paintings for sale. Artwork commissions taken. Pictures done from photograph. England seascapes a speciality. Portrait artist Stephen Lewis Gilmore can work from photographs but prefers to meet the subect if possible. Original art for your loved one. Forest painting art commission taken by English artist Stephen Lewis Gilmore. Woodland art to buy. Savernake Forest or your scene of choice. Examples of artwork. Affordable english art for sale. Wiltshire scenes. Include Liddington Hill and original art of an owl in flight. English artist Stephen Lewis Gilmore s abstract art online displays colours and vibrancy which speak of the oneness he feels with his beloved Wiltshire landscape. Pointillism pictures - examples of contemporary original art using an ancient technique. No half tones. Just black and white. Do you want to buy a guitar themed gift for a guitarist or a gift for someone who has everything! Why not invest in a unique gift of a landscape scene on a guitar or even a portrait? S L Gilmore is an artist and mural painting contractor located in Swindon and operating chiefly in Wiltshire UK. How to commission a mural via this website. External and internal murals. Stephen Lewis Gilmore is an experienced and accomplished artist with his work in private and public collections around the world.